Here is a very simple build to electronic circuit project of Wind Charger Circuit Using LTC1042. 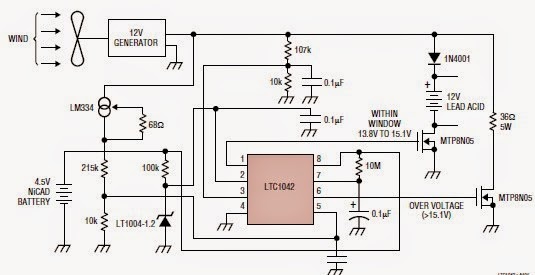 A very simple wind Charger circuit can be designed using the LTC1042 monolithic CMOS window comparator, manufactured by Linear Technology INC. This Wind charger circuit electronic project use the wind power to produce the energy required to charge Ni-Cd or Lead Acid batteries. As you can see in the circuit diagram, you will need an 12 volts generator, a dc motor can be used ( the output voltage is proportional to its rpm). As you can see in the circuit diagram, are connected two batteries: a 4.5 volts Ni-Cd and a 12 volts Lead Acid battery. If generator voltage output is below 13.8V, the control circuit is active and the NiCad battery is charging through the LM334 current source (the lead acid battery is not being charged). If the generator voltage output is between 13.8V and 15.1V, the 12V lead acid battery is being charged at about a 1A/hour rate (limited by the power FET). If generator voltage exceeds 15.1V (a condition caused by excessive wind speed or 12V battery being fully charged) then a fixed load is connected thus limiting the generator RPM to prevent damage.